Manchester United striker Wayne Rooney is facing a two-match ban after being charged by the Football Association for using offensive language. The 25-year-old swore into a pitchside camera after completing his hat-trick in Saturday's 4-2 win at West Ham. The England international has until 1800 BST on Tuesday to launch an appeal against the charge. If he accepts it, he will miss the league match with Fulham and the FA Cup semi-final against Manchester City. The FA's decision has been questioned by Professional Footballers' Association chief Gordon Taylor. In a statement issued on the PFA website, Taylor said: "Whilst the use of foul and abusive language is not condoned, there is an acceptance by all parties within the game that 'industrial language' is commonly used. "It becomes an issue when directed towards match officials. However, when used in a spontaneous way in celebration or frustration then it is not normally expected to merit a sanction. "If sanctions are to be imposed in such circumstances then this has to be done in a balanced and consistent manner, and participants made aware of this fundamental change in approach." United could look to ask for the punishment to be halved by the FA. If Rooney denies the charge, a hearing will take place on Wednesday. A one-match ban would result in the United star missing Saturday's Premier League game at home to Fulham, while a two-match suspension would also rule him out of the FA Cup semi-final against Manchester City at Wembley on 16 April. 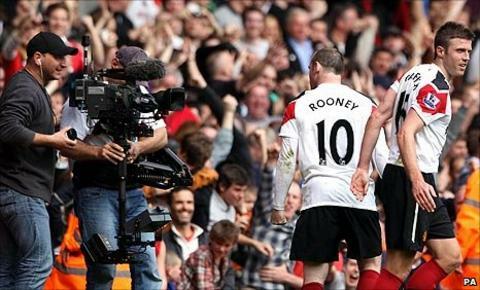 Rooney quickly apologised for his actions after the victory which moved United seven points clear at the top of the Premier League. The 25-year-old was influential in earning the three points for the Red Devils as he grabbed his three goals in 14 minutes to help his side recover from 2-0 down. In a statement released by United on Saturday, the striker said: "I want to apologise for any offence that may have been caused by my goal celebration, especially any parents or children that were watching. "Emotions were running high, and on reflection my heat-of-the-moment reaction was inappropriate. It was not aimed at anyone in particular." Although Professional Football Association deputy chief executive John Bramhall described Rooney's actions as "disappointing", he said the player acknowledged his responsibility by issuing a swift apology. "Taking into account the highly pressurised situation within the game, it is still an action that wasn't acceptable and Wayne's apology confirms that," Bramhall told BBC Radio 5 live. "He has apologised immediately after the game and has clearly realised that they are not the actions you would expect of a player in his position." United team-mate Rio Ferdinand urged the media to show leniency towards Rooney through his Twitter account on Sunday. The defender called for newspapers and radio "to give Wayne a break" adding "he knows what he did was wrong". Ferdinand said he had spoken to Rooney and the United forward was "genuinely sorry". FA rules state: "A participant shall at all times act in the best interests of the game and shall not act in any manner which is improper or brings the game into disrepute or use any one, or a combination of, violent conduct, serious foul play, threatening, abusive, indecent or insulting words or behaviour."